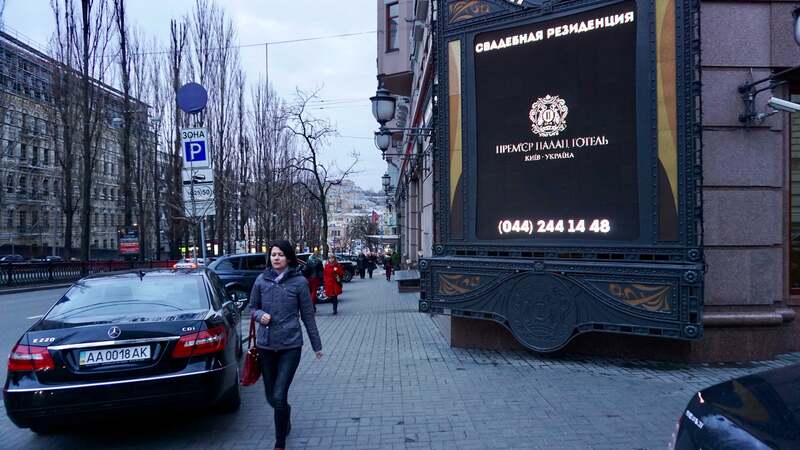 KYIV, Ukraine—With the world’s eyes on London the day after a lethal terror attack outside of Parliament, a series of violent incidents swept across Ukraine on Thursday, highlighting what lawmakers in Kyiv said was a covert effort by Moscow to destabilize the country. The broad daylight assassination of an exiled Russian lawmaker in central Kyiv on Thursday morning came just hours after a massive explosion at a military ammunition depot in the town of Balaklia in northeastern Ukraine, which forced 20,000 people to evacuate, according to the State Emergency Service of Ukraine. In a meeting with security officials in Kyiv on Thursday, Ukrainian President Petro Poroshenko addressed the parallel timing of the incidents. “I believe it is not a coincidence that the murder took place on the same day with the sabotage in Balaklia,” Poroshenko said. Also on Thursday, in Odesa, a shipping hub on the Black Sea and Ukraine’s third most populous city, Ukraine’s top security agency arrested nine men accused of belonging to a sabotage ring organized by Russia’s foreign military intelligence agency, the GRU. “We conducted a multi-stage special operation to defang the network overseen by Russian special services,” Oleksandr Tkachuk, department chief of the Security Service of Ukraine, or SBU, said Thursday, according to Radio Poland. Van Herpen said the SBU’s Odesa bust was probably a “lucky hit,” the timing of which was only coincidental with the other incidents on Thursday. However, “it makes clear that the Kremlin has not given up its aggressive plans to reconquer Novorossiya,” Van Herpen added, referring to Russia’s historic empire north of the Black Sea, which is in present-day Ukraine. A former Russian parliamentarian named Denis Voronenkov, a Russian President Vladimir Putin critic who fled to Ukraine in 2016, was shot dead at about 11:25 a.m. Thursday as he was leaving the Premier Palace Hotel in central Kyiv with his bodyguard. The bodyguard returned fire and was wounded in the exchange, according to a statement by Kyiv’s police chief, Andrei Krishchenko. Voronenkov died on the scene after being shot four times, twice in the head, and once in the neck and stomach, according to authorities. 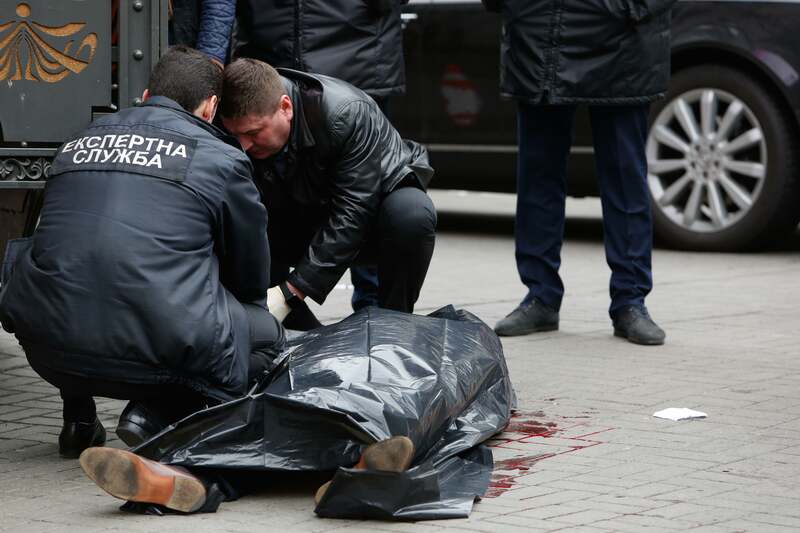 The assassin, who was wounded in the exchange, later died while in surgery at a hospital in Kyiv, according to Ukrainian news reports Thursday afternoon. “Once again we see a textbook method of the Russian special forces which we have repeatedly seen in various European capitals,” Poroshenko said in the statement. Voronenkov’s body was left lying in a pool of blood on the sidewalk just yards from Shevchenko Park, a popular place for families and students to enjoy a spring afternoon, and nearby the entrance to Taras Shevchenko National University of Kyiv, the country’s premier academic institution. Voronenkov and his wife were granted Ukrainian citizenship in December 2016. The former Russian lawmaker was a key witness in Ukraine’s treason case against former Ukrainian President Viktor Yanukovych, who fled to Russia after he was overthrown by pro-European street protests in February 2014. Voronenkov was an outspoken critic of Putin. In February 2017, the former Russian Communist Party member compared Putin’s regime to that of Nazi Germany. The brazen assassination of such a high-profile Putin critic spurred some, including Poroshenko, and Ukrainian Prosecutor-General Yuriy Lutsenko, to immediately speculate that Russia was behind the attack. “It was a demonstrative execution typical of the Kremlin,” Lutsenko wrote on Facebook. As of Thursday afternoon, the number of casualties from the Balaklia weapons depot explosion remained unclear. And while, as of Thursday afternoon, investigators had not officially announced whether it was an accident or a deliberate act of sabotage, many Ukrainian lawmakers and foreign analysts immediately speculated that Russia was involved. “It is one of the largest depots in Ukraine and it is a sign to the Ukrainian government that Russia can hit Ukraine where it chooses to do so,” Van Herpen said. Some, however, doubted whether Thursday’s incidents across Ukraine were deliberately timed to coincide with each other. The Organization for Security and Cooperation in Europe, or OSCE, is the multinational group charged with monitoring the Ukraine war’s cease-fire. The ongoing war in eastern Ukraine, which began in April 2014, has flooded Ukraine’s black market with illegal weapons and ammunition. According to Bociurkiw, the availability of weapons from the war zone could pose a security problem for Ukraine. “We do know that there are many arms circulating in Ukraine and this has led to more criminality,” Bociurkiw said. According to the Ukrainian General Prosecutor’s Office, there were around 2,000 weapons-related crimes in Ukraine in the first nine months of 2014, compared with 581 during the same period in 2013—a 345 percent increase in one year, coinciding with the war’s outbreak. Meanwhile, fighting in the ongoing war in eastern Ukraine did not let up on Thursday. 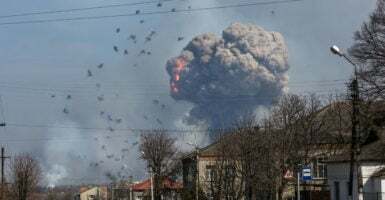 The Ukrainian military said its forces came under fire 84 times over the previous 24 hours from a combined force of pro-Russian separatists and Russia regulars, which have been engaged in combat operations against Ukrainian government troops for almost three years. According to Ukraine’s military, Thursday’s attacks comprised 120 mm and 82 mm mortars, infantry fighting vehicles, grenade launchers, heavy machine guns, and Grad multiple-launch rocket systems. One Ukrainian soldier was killed and one was wounded in the fighting, a Ukrainian military spokesman said. 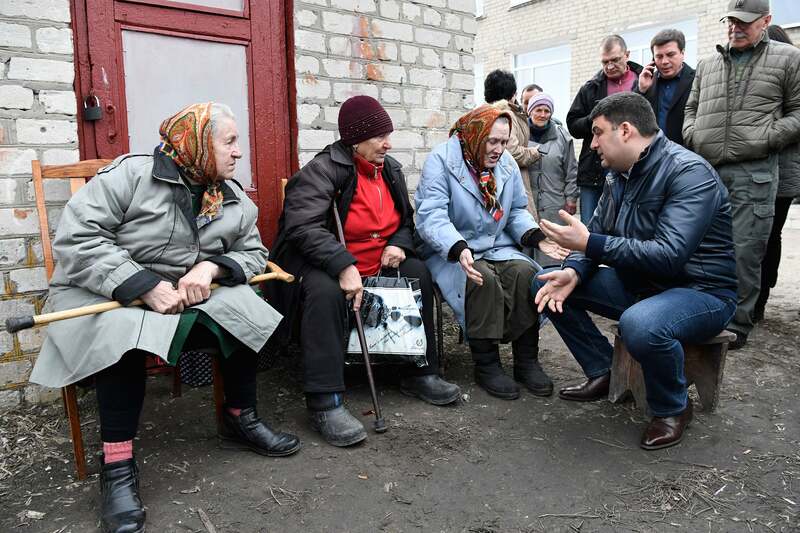 The war in Ukraine has so far killed about 10,000 Ukrainians and displaced about 1.7 million people.